Even though we don’t know the exact dates and details of the first Thanksgiving, we know what the tradition has come to mean for us and to our families as we gather for this holiday steeped in tradition. No, it doesn’t matter that the pilgrims and Indians most likely ate venison and seafood instead of turkey, or if your family chooses ham, goose, or a vegetarian spread. What matters is that we have traditions that tell us to gather with our loved ones, despite our differences, to be joyous, thankful, and maybe even a bit reminiscent. Perhaps your family all live in the same town, but it takes the tradition of the holidays to draw you together. Or, this may be the only time this year you will see the cousins you grew up with, have the chance to relive the carefree summers at Grandma’s farm, and recall the creak of that old screen door. We are thankful for the traditions of this season and also for our customers. It’s been such a joy these last 34 years helping each of you create homes that embody the past while making memories for the future. We'd love to hear about your family's favorite holiday traditions. Join the discussion on our Facebook page. Mouldings are a great way to bring traditional decorating into your home. Our broad selection of Moulding styles and materials is suitable for a large variety of applications, and most Mouldings are easily installed by the homeowner. Casing is the wall trim around a door or window. It can be plain or moulded. In addition to being decorative, Casing can conceal gaps between the wall surface and door or window jambs, while also covering most of the jamb for a more finished look. Baseboards are used at the bottom of walls to nicely finish this area and to provide additional decoration. Our Casing & Baseboard Installation System is extremely easy because our Corner Blocks, Base Blocks, and Baseboard Corner Posts permit installation of Casing and Baseboard mouldings without tedious miter (angle) cuts. Mouldings are not limited to use around doors and windows. Crown Mouldings can also transform ordinary ceilings into unique and special features for your rooms. 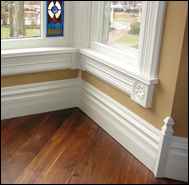 Crown Moulding Drops can be used in the corners to eliminate miter cuts. However, Crown Mouldings are typically installed with miter cuts. If you will be mitering, our Crown Moulding and Trim Book and Crown Moulding Template Set can help you master this traditional way of installing Crown Moulding. You can combine our Crown Mouldings with other components such as Plain Boards and Nosings to create your own unique designs. 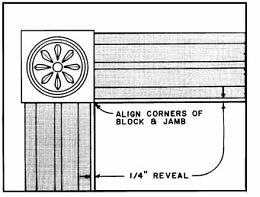 We have suggested Crown Moulding Assemblies, like Assembly #4 shown above, to help get your creative juices flowing. And, we have synthetic Mouldings in PVC and Polyurethane if your project is outside, in a high moisture area inside, or if you simply prefer not to have to paint! Please see our Product Listings for our complete selection of Mouldings and related items. "Their name is "Vintage Woodworks." This alludes to old time products. Let me tell you that not only do they carry a vast variety of old and new style, their customer service takes me back to days of old, when the customer came first. They go the extra mile to help. They should start a consulting company... "Vintage Consulting," and teach these new companies how to do it right!" Here are a few of our favorite Thanksgiving traditions. Share yours on our Facebook page. "It's food, football, then we pull out all the Black Friday ads and sit at the table to start a list for shopping." "I am always fond of the talks on our 6 hour drive. Dominic (our freshman in college) will be traveling with us, and I look forward to the opportunity to chat. And, we bake cookies the day after Thanksgiving!" 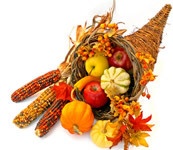 Rita G.
"The last several years I have enjoyed Thanksgiving Day with my son-in-law's family since my Mom goes to Louisiana to visit with her husband's family. Then the next weekend, I get to celebrate again with them." Sandy L.
Share your favorite traditions on our Facebook page. Baseboard, Casing, Blocks, and Corner Posts give this room traditional style while avoiding tricky miter cuts.